Let’s face it… ear infections are common problems with kids. When it comes to treating these things naturally, you’ve got to know what the real issue behind an ear infection is. Once you know what’s going on, you’ll be more confident in knowing how to treat the root of the problem with these natural ear infection remedies. Today, I have a few resources for you that will help when it comes to actually treating an ear infection naturally. I’m going to share my recipe for making a power-packed ear infection oil, as well as a few other tried and true home remedies that are worth a shot as well! Natural ear infection remedies are great to have on hand for those unexpected issues. This oil is formulated to do two things. Simmer on the stove using low heat for 1-2 hours. Your oil should smell like garlic and herbs and it may even turn a slight green color. Strain your herbs from the oil using an old t-shirt or strainer and coffee filter. Lastly, place the final oil in a dropper bottle and label with what it is, the herbs used, and how often to use it. How to use: Before you do anything else… test your oil first. You can test on the back of your wrist or test in your ear. The reason is because you don’t want to have used too much garlic and have the oil burn. Keep your oil at room temperature so that when you put it in your child’s ear it doesn’t hurt from being too hot or cold. Place 3-4 drops in both ears 3-4 times a day. It doesn’t matter if you think your child has an ear infection in only one ear. It’s best to treat both simultaneously. You can put cotton balls in ears to keep oil from running out, but you shouldn’t have much problem with that since you aren’t using much oil. Use this oil for up to 2 days after pain resides to make sure infection is truly gone. Another great natural remedy you can use when your child has an ear infection is to make an infection-fighting massage oil using essential oils. 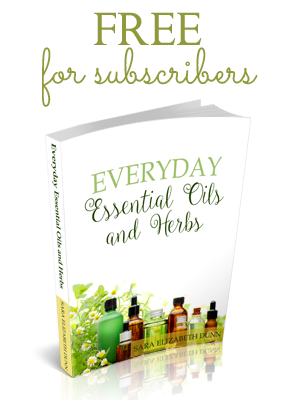 CLICK HERE to see how to make and use it over at Growing Up Herbal. Colloidal silver is a great natural medicine cabinet product to have on hand. Not only is it anti-bacterial, but it helps to boost the immune system. CLICK HERE to see how it’s used for ear infections from Jill’s Home Remedies. Onions are a cousin to garlic and they too have anti-bacterial and anti-inflammatory properties. The great thing about onions is that they can be used to help ear infections. CLICK HERE to see 2 ways to use onions for ear infections from Gwen’s Nest. Do you have any tips or stories to share with us when it comes to treating ear infections naturally? Don’t be shy… share them in the comments below! We’d love to hear from you! We hope these natural ear infection remedies are a great help to you in the future. Meagan Visser is a Registered Nurse turned SAHM to 3 small boys. She’s currently a family herbalist that is passionate about herbs. With her background, Meagan has delved into both worlds, the modern medical world and the traditional natural world, to find the best ways to work with a child’s body so that it can do what it was made to do. She teaches parents how to take charge of their children’s health naturally on her site GrowingUpHerbal.com and in her Letters To Natural Mamas. I have five children ages 7 to 15 and we have always used home made garlic oil for ear infections. We have avoided antibiotics for ear infection completely, but I have never added a herb for inflammation. Could you use a different herb to decrease inflammation, such as turmeric? I live in Mexico, so I was trying to think of a herb that I have available to me here. Great article thanks! Hummm… I’m all about using herbs that grow in your area, so if you can find an anti-inflammatory herb near you, that would be great. I don’t know that I’d use powdered turmeric though because you wouldn’t be able to filter out the powder very well. If you could use actual turmeric root, that would be better, but also keep in mind that it may stain your kids ear yellow! Is there a minimum age for these remedies? My son went for 9 months with absolutely no illness, but then we just went through 2 rounds of antibiotics to get rid of a lingering ear infection. I know how devastating antibiotics can be to a young baby, but I felt like I had no choice but to use them because he was so sick and I wanted him to get well quickly. Next time, I want to be ready with some natural remedies on hand. I just want to make sure they are age appropriate. Thanks so much for writing about this! These remedies are fine for a baby your son’s age. All the herbs and oils are child safe so you should have no problems. Just be prepared, consistent, and keep an eye on him. And for the antibiotics he’s already had, I’d recommend some intensive probiotic therapy to help restore his normal gut flora. Thanks for your comment Holly! HI, would it be OK to use this oil even in the case of an ear infection with an already punctured ear drum? Would this be safe for a baby under 6 months? How long is this garlic oil good–do I need to make it fresh each day? Where can I find a bottle to put it in? Would an repurposed small hand sanitizer bottle work after the alcohol has evaporated, or would there be enough of that left in the plastic to cause a problem? Thanks for your expertise and help! oh, I just commented on part 1 that I used a homemade mullein infused olive oil, for my son’s recent ear ache. What I made was just a plain mullein infused oil using the fresh flowers of the plant and a top grade olive oil alone. This sounds wonderful though with the addition of chamomile and garlic and will be my next project… Next summer/fall. Thank you! Also, I was always told never to place the oil directly in the ear but rather place a few drops on a cotton ball which is placed in the ear (and what I’ve always done). I’m not quite sure of the reasoning but it seems to work.